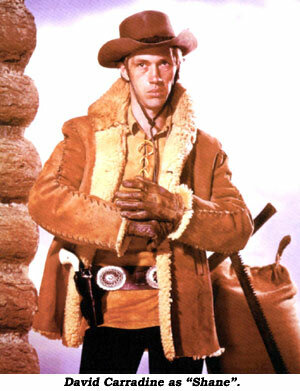 ABC’s short-lived “Shane” made a valiant effort at transferring the big screen movie hit of 1953 to the small TV screen, but David Carradine simply wasn’t Alan Ladd and, basically, by 1966, westerns on TV were (unfortunately) not showing the strength they had in the early ‘60s. Following the premise of the movie, silent, brooding gunfighter Shane (Carradine) rides onto the Starrett homestead, finding work as a ranch hand, and is drawn into the violence of the ongoing range wars fired by cattleman Rufe Ryker (Bert Freed) who wants homesteaders out of his Wyoming valley at all costs. In the series, Marian Starrett (Jill Ireland) is widowed, eliminating the Van Heflin-husband role and providing for a clearer path to romance between Marian and Shane. Marian does have a young son, Joey (Christopher Shea), who idolizes Shane as in the movie. Added is Marian’s all-wise father-in-law, Tom Starrett (terrific character actor Tom Tully). Though “Shane” was a well made one hour color series with plenty of action, the series failed to catch on. Attempts to convert a huge screen hit into a TV series are always difficult and generally fail. Another stumbling block was it’s Saturday night time slot, opposite the celebrated Jackie Gleason on CBS and the kiddy-appeal of “Flipper” on NBC. 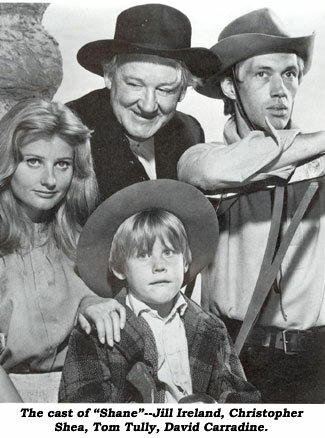 ABC tired its best with “Shane” from Sept. 10, ‘66 to Dec. 31, ‘66 but canceled its run after only 17 low-rated episodes. The entire cast are all deceased. Carradine went on to success with “Kung Fu” in ‘72. At 72, Carradine died in Bangkok, Thailand, under mysterious circumstances on June 3, 2009. Jill Ireland married Charles Bronson in ‘68 and died at only 54 in 1990 of cancer. Freed died at 74, 8/2/94. Tully died at 85 in 1982. Sam Gilman, who played storekeeper Sam Grafton, died at 70 in 1985. Young Christopher Shea died at 52 August 19, 2010, in Humbolt County, CA.